Slow Cooker Cajun Potato Soup - easy potato soup jazzed up with cajun seasoning and andouille sausage. Frozen hash browns, chicken broth, andouille sausage, cajun seasoning,chicken soup and cream cheese. SO easy and SOOOO good. Everybody went nuts over this! Can use smoked turkey sausage instead of andouille. Serve with some crusty bread for an easy weeknight meal! 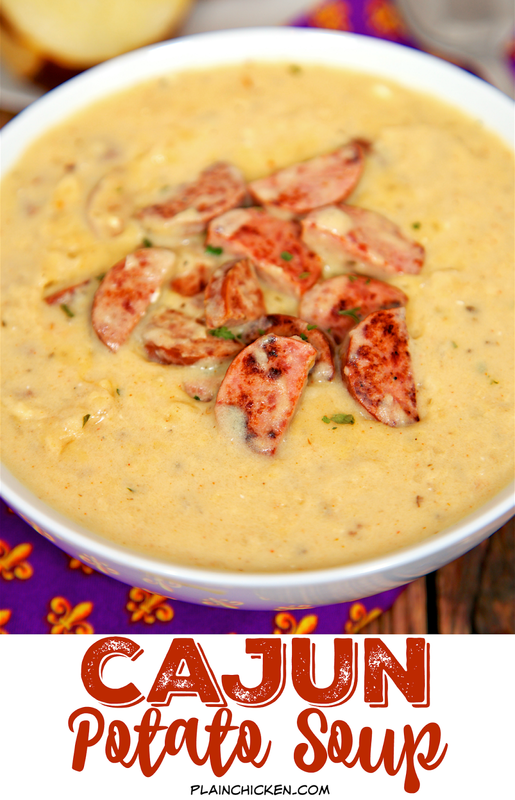 This kicked up Cajun Potato Soup is a new favorite! 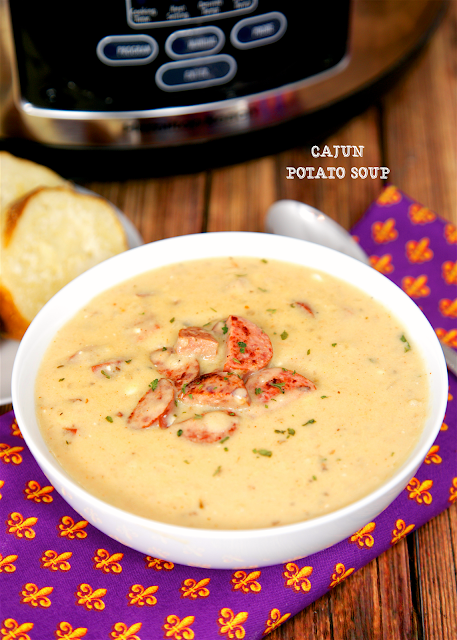 I took our favorite Slow Cooker Potato Soup recipe and jazzed it up for Mardi Gras. I added Cajun seasoning and andouille sausage! It is crazy good! We ate this for dinner and lunch the next day. It tasted just as good reheated for lunch. 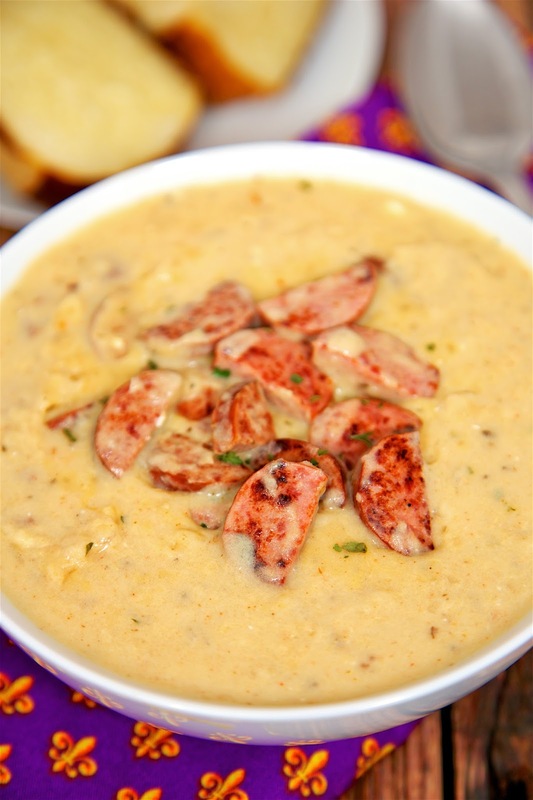 If you are looking to reduce the calories in this soup, you can swap the andouille for some smoked turkey sausage. I've made with andouille and smoked turkey sausage. Both versions are great. You could even use a combination of andouille and smoked turkey sausage. This soup is super easy to make. Brown the sausage, dump everything in the slow cooker and let it do all the work for you! Serve this with some crusty bread for an easy weeknight meal! In a large skillet over medium heat, cook sausage until brown. About 5 minutes. Add to slow cooker. Add everything except for the cream cheese to the slow cooker. Cook for 8-10 hours on low. About 15 minutes before serving, add cream cheese. Stir until melted and thoroughly combined. This sounds delicious! Guess I need to add that sausage to the never ending grocery list. Ha! Very interesting take on potato soup - looks delicious. Could the time on this be shortened? How long on High? Not a fan of cream cheese...any substitutions maybe heavy cream??? I used cheddar cheese soup instead of cream of chicken (not a fan) and cooked this on the stovetop. Added a can of soup (felt it needs some color & crunch). We loved it! Definitely a keeper!